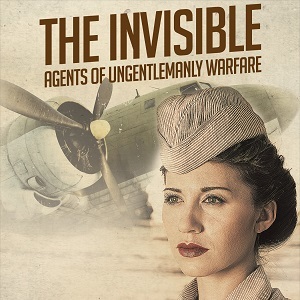 The Invisible – Agents of Ungentlemanly Warfare focuses on an elite team of female spies, members of the “Ministry of Ungentlemanly Warfare”, secretly created after the fall of France in 1940 to sabotage the Nazi war machine. Charismatic Canadian millionaire William Stephenson convinced Churchill & Roosevelt that the Nazis could only be stopped by taking the war off the battlefield & putting it in the hands of civilians, waging a secret guerrilla war & ‘setting Europe ablaze’! The Invisible is a genre busting, multilingual, “film noir musical” for our times, a contemporary portrait of seven extraordinary women who risked their lives to fight a dangerous war of sabotage, propaganda & espionage during WWII, only to find themselves betrayed by the very world they believed they were fighting for.